Here are the next two chapters from our latest e-book, Soul Awakening. This vital and timely e-book is being released in parts each Sunday through this newsletter as a public service to spiritual seekers everywhere. Along the way to the fruition of your creative idea, how will you know what steps to take and when? Fortunately, you have an inner compass which always points in the right direction. Every time you think of your desired new reality, ask yourself what course of action fills you with the most inner joy. What is the most joyful thing you could do now to bring you closer to that goal? The most joyful idea at any moment is the next step in your path towards your self-made destiny. Decide upon a desired goal and imagine what it will look like once it is made manifest. Detach from your present point in time and allow your mind to move forward to that point in time when it will become manifest. Imagine yourself experiencing the end result. Feel the excitement of what it is like to be a part of that manifested goal. Imagine how it feels to experience that new reality. Feel the mood in order to fully immerse yourself in that new reality. Now return your attention to your present time. Each night, as you fall asleep, reinforce your desired reality with additional creative power. Move forward along your timeline to where the new reality exists and become at one with the experience of its manifestation. Reach up to the highest frequency of universal love energy by expressing gratitude to the Creator for life itself. Fill your new reality with the magnetic energy of the love that you are experiencing. Then, move back along the timeline to your current time. Notice how the path back is often shorter because the extra power has just made this reality capable of materializing sooner. This vital and timely e-book, Soul Awakening, is being released in chapters each Sunday through this newsletter as a public service to spiritual seekers everywhere. From the crowded, run-down streets of Cairo to the oil-financed halls of power in Kuwait, Arab leaders appear increasingly rattled by the unfolding events in Tunisia and elsewhere in the Arab world, where men continued to set themselves on fire — two more in Egypt on January 18, and a third who was stopped. Though the streets of Cairo, Algiers and other Arab cities around the region were calm, the acts of self-immolation served as a reminder that the core complaints of economic hardship and political repression that led to the Tunisian uprising resonated strongly across the Middle East. But while there is widespread anticipation about a revolutionary contagion, particularly in Egypt and Algeria, where there have been angry and violent protests, political analysts said that each country is different, making such conclusions premature. Egypt lacks the broad and educated middle class of Tunisia, while in Algeria the middle class failed to join the angry young men in rioting, regional experts said. In Jordan, an Islamist opposition party, the Islamic Action Front, issued a demand that the offices of prime minister and other high officials be made elective instead of appointive, as they are now. But like the other outbursts, it quickly died away. So for now, the most pronounced impact from the unexpected Tunisian uprising is a lingering sense of uncertainty. That is itself either unnerving or exhilarating, depending on one’s perspective, in a region sitting on the fault lines of religious strife, political repression and economic uncertainty, experts said. Some Arab leaders have ordered security crackdowns to keep calm in the streets, and offered some symbolic gestures. In Syria, President Bashar al-Assad backed off the imposition of austerity measures. In Kuwait, the emir doled out money. In Egypt, where organisers are calling for a nationwide protest on January 25, officials struggled to project a sense of calm and normalcy, while stepping up talk of economic reform and government accountability. Arab leaders have also said they will focus on combating unemployment when they meet later this week at an economic summit meeting in the Red Sea resort of Sharm el Sheik. Before the riots in Tunisia turned into a mass uprising against the rule of the long-time autocratic president, Zine el-Abidine Ben Ali, it appeared that either Egypt or Algeria stood a greater chance of some kind of mass public revolt. For years, both have suffered from sclerotic political systems led by aging presidents, with support from the military. For years, both have confronted protests over difficult economic conditions and widespread youth unemployment. But Mr. Hamzawy noted that in Tunisia the middle class and the trade unions joined protests that initially broke out over economic complaints, and helped transform the discontent into calls for political change. In Egypt, where the leadership continues to rely on a decades-old emergency law that allows arrest without charge, there is a lot of room for free and critical speech, offering a safety valve for expression that did not exist in Tunisia, he said. In Egypt, he said, the array of interests that benefit from corruption is much wider than in Tunisia, where it was restricted to a small circle around the president. That, he said, means there are more people with an interest in preserving the system. And finally, he said, the military in Tunisia was not politicised and did not have any experience in securing city streets, unlike in Egypt, where the military has risen to the government’s defence before, and most likely would again. In addition, Mr. Hamzawy said that the protests that have racked Egypt recently have mostly been by workers for economic reasons, and that the government effectively bought them off with concessions before they began making political demands. In Algeria, Mr. Roberts said, there are two primary differences with Tunisia that make comparisons imperfect. The first, he said, was that in Tunisia the riots spread all over the country and eventually involved different elements of society all on the same side. “That gave the movement its moral power,” he said. But more fundamentally, he said, Algeria is not as repressive as Tunisia was. “It is not an autocracy, it is an oligarchy,” he said, explaining that in addition to the President, Abdelaziz Bouteflika, there are multiple power centres, like the military, the intelligence services and the elite bureaucrats. They appear increasingly rattled by the unfolding events in Tunisia and elsewhere in the Arab world. When the San Gabriel sailed around the Cape of Good Hope to finally dock at Calicut, a prosperous port and an independent principality on the Malabar Coast in May, 1498, half a century of the Portuguese tentative to find a sea route to India was finally crowned with success. The man behind the quest was Vasco da Gama (1460-1524) – a devout Roman Catholic whose nightlong vigil in a Lisbon chapel before commending himself to the unsure waters had finally paid off. and if ‘Christians and spices’ were his twin pretext at the outset, da Gama’s successive visits to India, first in 1500 to set up a ‘factory’ or a trading base, then in 1502 to wreak havoc on the port and Arab trading vessels alike, proved that Portugal and its prime sailor had other things on their mind as well. While da Gamma paved the way for the Portuguese to India, Dom Alphonso D’Albuquerque (1495-1515) chalked out and consolidated Portugal’s trade routes to India during the sixteenth century. Albuquerque was an imperial rather than a commercial emissary of Portugal. Harnessing strategic ports mainly in the Persian Gulf, along the west coast of India and beyond, overrode the need to garner support of the local rulers. This drove him to capture Goa on the west coast of India in 1510, Melaka (Malacca) on the Malay peninsula in 1511, Hormuz at the opening of the Persian Gulf in 1515, Bassein in 1534, Daman and Diu in 1535 and Colombo in 1597. The series of offensives proved that the Portuguese were the new rulers of the roost. Their mercantile and imperial strategies were paralleled by a drive to convert the masses to Roman Catholic Christianity. Temples disappeared from the Goan landscape to be replaced with churches, monasteries and seminaries. As the Portuguese Viceroy in India, Albuquerque encouraged mixed marriages with the intent of procuring fresh recruits, especially in the form of offsprings, to serve the Portuguese project in India and elsewhere. However, with the rise of military, political and maritime mights like the Dutch and the English, History forced the Portuguese in India into the wings. Unable to cast its net much further than Goa after being united to Spain, Portugal’s focus of interest shifted from India to more lucrative lands. The Dutch sailed their ships eastward for the first time in 1595. However, their first stop was not India but Jakarta in Indonesia where they lost no time in establishing their monopoly over the spice trade. India was significant only insofar as it constituted part of the great Asian trade route that the Dutch had developed and that cut through Ceylon and Cape Town. Even though in 1602, when the Dutch East India Company was chartered, the Dutch harboured no military ambitions about India, around 1605, a fleet of thirty-eight ships dispatched by the Dutch East India Company inflicted a crushing defeat on Portuguese ships off Johore and the Dutch wrested the fortress at Ambiona from Portuguese control. The unstoppable Dutch then went on to seize secret Portuguese maps and oceanic charts detailing the trade routes with India. These were soon to serve as guides to the eastern waters. The English entered the East Indies almost as the same time as the Dutch. However, the English were quick to realise that the Dutch were unwilling to share their turf in the East Indies with them. The tenacity with which the Dutch refused to relent on the East Indies forced the British to turn to India. Spices in India abounded in the south but the trade monopoly of the local rulers and other Europeans had to be broken. The British East India Company was established by the Royal Charter in 1600, and in course of time, the Protestant Dutch and English would embark upon the common project of eroding Catholic Spain and Portugal’s trade monopoly in the Indian Ocean. It is interesting to note, however, that although the Dutch had their ‘factories’ in Cochin, Nagapatam and even up in Agra, they did not give the idea of military expansion in India much thought. The spice trade was rewarding and they were quite content with just that. The Dutch and the English were not the only nations to take an interest in India in those days.The seventeenth century also saw the French making forays into India. While the success stories of the Dutch and the British East India Companies were a motivating factor, the reasons for setting up the French East India Company were not mercantile. The initial wave brought along men of letters, explorers, adventurers, missionaries et al. Jean Baptiste Tavernier and François Bernier’s vivid accounts of the Mughal kingdom and beyond went a long way in moulding Europe’s impressions about this distant, exotic and opulent land. The French set up their first trading post in 1666 at Surat. The Sultan of Golconda then allowed them to set up another trading post in Masulipatam on the Coromandel Coast in 1669. In 1670, the Sultan gave the French land in Pondicherry. In the next two decades, the French obtained trading concessions in Bengal and Chandernagore, and established a post at Mahe on the Malabar coast of southwest India. But the French East India Company did not turn out to be as prosperous as the Dutch and the British East India Companies. Meanwhile, the British had made some important moves. Sir Thomas Roe arrived at the Mughal Emperor Jahangir’s court as the envoy of King James I of England, and stayed in India from 1614-1618. While William Hawkins had already initiated successful diplomatic relations with the Mughal court, Roe consolidated them further, gaining in the process not only friends in the Mughal court but also the Emperor’s permission to establish a British East India Company trading post at Surat. Roe’s diplomacy with the Mughals paid off so well that by 1618, the East India Company became their unspoken naval aide. Henceforth the commercial rise of the British in India was meteoric. By 1661, Bombay was given to Charles II of England as dowry when he married Catherine of Braganza. Bombay was then dutifully passed on to the British East India Company. By 1708, around the dawn of the Modern Indian Era, the British found themselves quite comfortably placed in India, at least commercially. and Aurangzeb’s exit from Indian History in 1707 and its aftermath were to eventually throw up the new keepers of India’s destiny – the British. The decline of the Mughal empire after Aurangzeb’s death was shockingly swift. (See Medieval Indian History). Power and glory bowed out to disarray and disgrace The state treasury ran dry. It was clearly an oft repeated moment in History when devoid of will, a dynasty lingered on, waiting to be saved or damned. A series of disastrous invasions against Delhi finally broke its spirit. The first of these was led by the famous Persian king, Nadir Shah in 1739. At the time, the court in Delhi was fending off the Maratha offensive. One of the finest ministers of the Mughal court , Nizam-ul-Mulk met Nadir when the latter arrived near Delhi and talked him out of his initial idea of sacking Delhi by offering him Rs 50,00,000. The matter would have been settled had not one of Nizam’s rival generals at court convinced Nadir Shah that the latter was being short-changed. Delhi’s legendary wealth could not be relinquished for so paltry a sum. Soon Nadir Shah marched over to Delhi in time to have a khutba read in his name. Unfortunately, it was around the same time that a rumour about Nadir Shah’s death spread in Delhi. Not only was this news greeted with jubilation by the inhabitants of Delhi, some of them went so far as to actually attack a few Iranian soldiers. No one could have forseen the consequences. On March 11, 1739 an order was issued by Nadir Shah. Delhi witnessed yet another blood bath. Chandni Chowk, the fruit market, the Dariba bazaar and the buildings around the Jama Masjid were burnt to cinders. Each and every inhabitant of the area was killed in retaliation. People living around the area still point at the Khooni Darwaza (Gateway of Slaughter) in the old city and talk of the massacre as though it had taken place only the previous day. The royal treasury was sacked and its contents seized. When Nadir Shah left Delhi after 57 days, he also took along with him the fabulous Peacock Throne of the Mughals and the last remnants of the Mughal pride. Lead by Ahmad Shah Abdali, an ex-general in Nadir Shah’s army, the Afghans were the next raiders of Delhi. Abdali led as many as seven invasions into India between 1748-1767. An outbreak of cholera in Abdali’s army forced him to withdraw, though not before making the Delhi court cough up around 120,000,000 rupees. He also demanded, and got Kashmir, Lahore, Sirhind and Multan. This, unfortunately, was not the last time that Abdali was to invade India. and a retiring Delhi court would leave it to the Marathas to counter Abdali’s next invasion. Unable to resist the immense riches of Delhi, Abdali stormed the city again. On January 13, 1761, he took on the Maratha confederation, and humbled the Marathas in the third and final battle of Panipat, rooting out the possiblity of Maratha dominion over North India, at least for the next decade. Abdali returned in 1764, driven once again by his lust not so much for power as for gold. His sixth invasion had the Sikhs, who had by then carved out a kingdom for themselves under the famous Maharaja Ranjit Singh, up in arms. The determined Sikhs, who never allowed the Marathas to establish themselves up north, now put up a stiff resistance. When Abdali invaded India for the last time in 1767, he met his comeuppance at the hands of the Sikhs who then took Lahore and Central Punjab. However the areas extending from Peshawar and beyond remained with Abdali. Against this troubled backdrop, the British rise to power was slow, but remarkably steady. Slow because the British had an uphill task to accomplish; first there were the French to deal with. The commercial rivalry amongst the British and the French had its roots in the prevailing political situation in Europe. As long as the French carried on business in a small way in India, the British left them to themselves. But between 1720 and 1740, the French East India Company’s trade with India recorded almost a ten-fold growth to measure upto half the volume of that the British East India Company at the time. The stakes were too high for either to ignore – especially since the British East India Company generated more than ten percent of England’s revenue. This was the time when the War of Austrian Succession (1740-48) had broken out in Europe, following Fredrick the Great of Prussia’s seizure of Silesia in 1740. The French and British found themselves in opposing camps in this war. Later, during the Seven Years War (1756-63), both were at loggerheads with each other once again, supporting rival camps. These two European wars were to have an immediate bearing on India’s political destiny. Between 1746-48, the French and English finally came to blows in the first Carnatic War (1746-48) in the Deccan. Two more of these wars sealed the fate of the French East India Company in India. The first Carnatic War was perhaps a fallout of the Austrian War of Succession. The fight was over Madras and though the French had captured it, it was given back to the English as part of the Treaty of Aix-la-Chapelle of 1748. In the meanwhile the British and French had got their fleets upto the Indian mainland – an important development as the balance of power within the mainland was fast slanting in favour of the Europeans. and Dupleix, the French governor of the time, decided to turn the tide in France’s favour. A shrewd and resourceful character with great diplomatic skills and a fine understanding of local politics, Dupleix was nevertheless difficult to work with because of his nervous temperament and inadequate military knowledge. The opportunity Dupleix was waiting for came his way in 1748 when the Nawab of Arcot (in present Tamil Nadu) died leaving behind the question of succession unresolved. Dupleix succeeded in having a Nizam of his choice, Chanda Sahib enthroned. The new Nizam was supported by the old Nawab’s grandson, Muzzafar Jung, and backed by French troops under the able command of de Bussy. The idea was to close in on Madras by surrounding it with French territory. Everything would have gone off as planned but for Robert Clive who arrived in Madras as a clerk and proved himself to be a brilliant strategist. He laid the seige of Arcot in 1751 with a mere 210 men, turning Dupleix’s dream into a nightmare. Chanda Sahib was killed and a British nominee was placed on the throne of Arcot. Recalled to France in 1754, Dupleix retired in ignominy. Dupleix was succeeded by Godeheu, who sued for peace with the British. Both the French and the British agreed not to interfere in India’s internal matters and went back to their old positions. The French also agreed to give up everything they had taken so far. Godeheu was denounced for having ‘signed the ruin of the country and the dishonour of the nation’, but the damage was done. The British had emerged much stronger after the second Carnatic War. The third and final phase of this Anglo-French war for supremacy was precipitated by the Seven Years War in the shape of the third Carnatic War (1756-63). However, despite very fine French generals like de Bussy and Lally, the British inflicted a crushing defeat on the French who ended up losing practically everything they had in India. The dream of the ‘dominion de l’empire de la France’ in India was over. and thanks to their naval supremacy, greater resources and steadier support from Europe, the British had emerged as the clear winners. Thereafter, the British steadily rose to power in India, at least till the Uprising of 1857. The Uprising was a culmination of a number of factors. People were growing increasingly resentful of Britain’s political and cultural motives in India. But the mandatory use of Enfield Rifles, and cartridges greased with animal tallow – pig or cow – that were to be readied by mouth by practising Hindus and Muslims in the Sepoy Army of Indian troops, precipitated the event. There is enough evidence to support the fact that the Uprising had been planned for months before the actual outbreak. However, revolutionaries failed to spread the word about it beyond Central India and Delhi, and the Uprising did not quite unfold as planned. Had it gone according to schedule, the Uprising would have broken out in many areas simultaneously and been difficult for the British to contain. However, as things turned out, trouble erupted sporadically in various places in May 1857 and there was little, if any, coordination between the outbreaks. For the British, quelling such a rebellion was hardly intimidating. Stories about the British and Indian confrontation in Delhi in 1857 abound. Tales of valour and bravery about both sides alternate with accounts of unimaginable horror and destruction. The poet-Mughal in Delhi, Bahadur Shah Zafar, Tatia Tope of Gwalior (Gwalior itself did not rebel, Tope was merely a general), the Rani of Jhansi too joined in the rebellion as they had their own interests to protect. None of them would actually have rebelled had the British not rethought the `compensation’ that these rulers were being paid in exchange for a share in the governance. The people of Delhi, Lucknow, Gwalior and the rest of India, however, had nothing to gain, at least not personally. Their war was not for a private kingdom; they were fighting for freedom. Scholars and historians who have revisited the event have tried to define the Uprising in terms that were at times limiting or expansive – a simple Mutiny, India’s first National War of Independence, a Princely plot, to name few. In any case, it would be difficult to package the event in a single neat definition. Following the Uprising, the British Crown in Parliament formally took over the responsibility of ruling India from the British East India Company. What was happening in the Indian society all this while was difficult to overlook. A cultural revolution had been taking place even before the Uprising of 1857. Sati was banned, the Arya Samaj was a new religious alternative, education for women was encouraged and a whole new breed of intellectuals – mostly from Bengal – were making their presence felt. This new breed of Indians was a power to reckon with. After the Uprising, India was poised at the dawn of a new era of political awareness. In December 1885, despite the Governor General of India, Lord Dufferin’s reluctance to endorse the idea, Allan Octavian Hume formed the Indian National Union (which would soon be renamed Indian National Congress), alongwith seventy-two learned Indian delegates hailing from different parts of the country. The Indian National Congress’ first meeting took place in Bombay in 1885, and was presided over by W C Bonnerjee. In its early phase, referred to as the phase of the Moderates (1885-1905), the Congress pledged loyalty to the British. The moderates were a class of elite erudite men who were into philosophy and intellectual discussions; the much more popular peoples’ leaders were to follow. One of the most prominent leaders, Dadabhai Naoroji, wrote extensively to highlight the drain of wealth from India to Britain. The Congress was soon to enter a turbulent phase, and in 1907, during the session at Surat, there was an open split in the party. The moderates led by Gopal Krishna Gokhale and Pherozeshah Mehta and those that the British qualified as extremists headed by Bal Gangadhar Tilak, parted ways. The Congress would regain its vitality only years later (1919-1934) under the leadership of Mahatma Gandhi. In 1905, Lord Curzon’s brainchild, the partition of Bengal was implemented. The decision evoked sharp reactions from all quarters of India. The day on which the partition came into effect was observed as a day of mourning and fasting throughout Bengal. Rabindranath Tagore, the famous Nobel-laureate and writer, passionately spoke out against it. This was the time when the Swadeshi movement was first launched; Indians participated in auto-da-fés of foreign goods and turned to indigenously manufactured articles. Lots of young leaders from Bengal took up the task of educating people. On August 15, 1906, a National Council of Education was set up under the educationist Aurobindo Ghose. The government came down heavily on the agitators, disrupting meetings, insulting leaders and beating up peaceful protestors. In 1907, Lala Lajpat Rai and Sardar Ajit Singh were deported from the Punjab. In 1908, Bal Gangadhar Tilak was arrested and sentenced to six years of prison. Aurobindo Ghose was arrested, prosecuted and although acquitted, he chose to retire to Pondicherry. The agitation against the partition of Bengal (although the partition was revoked in 1911) ushered in the age of Indian nationalism. It was a question of time before this nationalistic fervour settled down to the more concrete issue of how India was to cast aside the British yoke. While Great Britain was entangled in World War I, India’s national movement, despite being at a nascent stage, continued to throw up surprises. In December 1915, Bal Gangadhar Tilak, the first nationalist leader with a deep understanding of India’s grassroots, and a considerable following, voiced the idea of Home Rule (`swadeshi’, was a word the British were wary of). It was for the first time that someone had alluded to Home Rule being the goal of the Indian National Movement. On April 28, 1916, the Home Rule League was founded, with its headquarters in Poona (Pune). Tilak went on a whirlwind tour of the country, appealing to everybody to unite under the banner of Home Rule League. Annie Besant who subscribed to the cause herself assisted him in this task. The implications of the Home Rule movement were clear to all now. 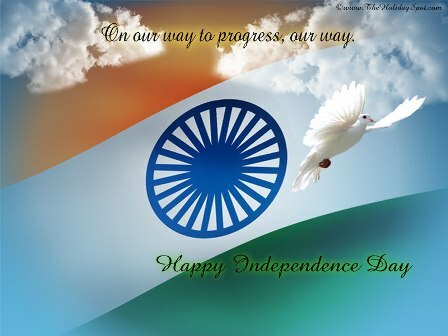 The independence of India was the goal of the Indian national movement. But while the idea of independence was swiftly gaining ground, for the most part, the bougeoisie was still unsure about whether it needed to jump into the fray or hold itself at bay. Meanwhile the Crown rule decided to tighten the clamps. Laws were formulated to prevent agitations, undesirable elements were banned from entering India, propaganda came under government scrutiny – the British had reason to be nervous. and then, as Jawaharlal Nehru would later say, Gandhi came. He was not anyone’s idea of a charismatic leader. Just a short, thin, shrivelled man, with what Sarojini Naidu called `Mickey Mouse ears’ and a twinkle in his eyes. He talked of ahimsa, or non-violence and ahimsa would finally disarm the British. When Mohandas Karamchand Gandhi finally returned to India from South Africa at the age of 46, his arrival was preceded by his formidable reputation as a political leader. Moments after having docked at Bombay, he was asked to lead the National Movement. Gandhi, however, declined, opting to get to know India thoroughly. The first causes he chose to associate with were minor local affairs, and the nationalist leaders of the time did not know what to make of this almost too-mild, too-moral and too-impractical maverick. During 1917-18, with revolutionary conspiracies being on the rise within the country, the British grew progressively uneasy. To counter these, Justice S A T Rowlatt proposed the Rowlatt Acts. Among other things, this act empowered the government with special wartime controls that included the right to try political cases without a jury, and gave the provincial governments along with the centre, the power to imprison without trial. Gandhi, in his typical style, said that the repressive Rowlatt Acts raised issues of trust and self-respect, and hence needed be met with a moral response in the form of a hartal, or a protest that entailed striking work on April 8, 1919. The flashpoint came in Punjab. On April 12, 1919, General R E H Dyer who had taken over the troops in Punjab the day before, prohibited all meetings and gatherings. So when a group of unarmed people congregated at the Jallianwala Bagh, a walled park with only a single narrow entrance, on April 13, 1919 to celebrate the Sikh festival of Baisakhi. What followed was to blight the pages of Indian History and its peoples’ minds for a very long time to come. A peaceful congregation had been transformed into an unmitigated blood bath. Later, during the court martial, General Dyer coldly observed that he had fired only 1600 rounds of ammunition on the crowd as that was all he had. He added that he would have fired more had he so deemed fit. The brutality of the Jallianwallah Bagh massacre shocked the country. It also shook the moderates out of their stupour and brought Gandhi out in the open. In 1920, under the leadership of Mahatma Gandhi, the Indian National Congress launched the first movement of protest – the Non-Cooperation Movement. It involved surrendering all titles, honorary offices and nominated posts in local bodies. Government functions and darbars were to be boycotted. Parents were requested to withdraw their children from government schools and colleges. Indians stayed way from the British courts and army, and were to stand for elections to government and legislative bodies. Ahimsa or non-violence was to be observed strictly. The magnitude of the Non Cooperation Movement amazed every political leader in India. Gandhi’s approach was not so meek after all. The idea appealed immensely to popular imagination and suddenly, in a single sweep, the Non-Cooperation Movement had touched every man on the street. People came out in droves to support Gandhi and his movement. The government machinery did not actually break down, but came under visible strain. Unfortunately, at a time when the movement was showing signs of success, in Chauri Chaura, a mob of 3000 people killed 25 policemen and one officer. Similar incidents had taken place earlier on November 17, 1921, in Bombay and on January 13, 1922, in Madras. On February 7, Gandhi suspended the movement. He was arrested on March 13, 1922. Suddenly, the future of swaraj, or self-rule within a year seemed uncertain. Gandhi came under fire from several quarters for disassociating himself from the Non-Cooperation Movement. The man of the masses took the masses along when he made his exit. and this was not to be the only time when differences of opinion cropped up in the Congress about Gandhi’s actions. and each time, in the end, people invariably gave in to the Mahatma. Gandhi had won over the heart of an entire nation. In 1927 the British government set up a committee headed by Sir John Simon to review the state of affairs in India. However, the committee that came to be known as the Simon Commission did not include even a single Indian. The Congress took umbrage to the omission. On February 27, the plan for the agitation was made public. The entire nation was in ferment. Everyone, including the British, was curious to see what the Mahatma would do next. On March 12, 1930, accompanied by 78 colleagues of the Sabarmati Ashram, Mahatma Gandhi embarked on a 60-mile march to the sea coast of Dandi. He intended to defy the new salt taxes that the government had levied and that would directly impact each and every peasant. To begin with, the government thought it better to ignore the event. However, soon the entire country was abuzz with hartals, protests, agitations, processions. The rising tide of discontent had to be checked. Gandhi was arrested on May 5, 1930. Abbas Tyabji took the relay to lead the movement. When Tyabji was arrested, Sarojini Naidu, the nightingale of India, replaced him. The Mahatma and Lord Irwin finally met. The result was the Gandhi-Irwin pact. Amongst other things, the Civil Disobedience Movement was withdrawn under the pact, and a second Round Table Conference with Congress participation was agreed upon. This peace did not last long. Gandhi attended the Second Round Table conference in London in 1931 as the sole representative of the Congress. He demanded control of foreign affairs and defence, and the matter of minorities, with little help from Muhammad Ali Jinnah, His Highness the Aga Khan and Dr Bhimrao Ramji Ambedkar, ended in a complete deadlock. Gandhi returned to India on December 28, 1931 empty-handed. By May 1934, the Civil Disobedience Movement had been completely withdrawn. During World War II, the Congress decided that India should co-operate with Britain on the understanding that complete independence would be granted to India after that. The British, however were unwilling to discuss the issue of independence during wartime. This had the members of the Congress wondering about the intentions of the government. Meanwhile, the divide between Jinnah’s Muslim League and the Congress’ aims and demands had grown sharper. In early 1940, Jinnah declared Pakistan as the goal of the League. After the fall of France in 1940, Gandhi declared, “We do not seek independence out of Britain’s ruin.” The British reply to this was an offer to discuss an Indian constituent assembly, as well as Dominion status `after the war’. The offer was spurned. This resulted in yet status would be another deadlock not to be resolved till 1947. Gandhi with his usual innovative skill now had the country and Congress rallying behind him. The moment had arrived to launch the Quit India movement. The unnerving part was that the launch of another Civil Disobedience Movement could coincide with the Japanese advances from the far-east towards India. “After all,” Gandhi said, “this is open rebellion.” The country was willing to court risks for the freedom that was to be won. From 1942 onwards it was quite clear that the countdown to an independent India had begun. In 1946, Lord Mountbatten arrived in Delhi amid a buzz of political activity. After World War II, the British seemed keen to wash their hands off India. For their part, the Indians were not loathe to such an idea. It was one of the worst movements of people in recent history after that of the Jews in the World War II. A nation was dismembered. 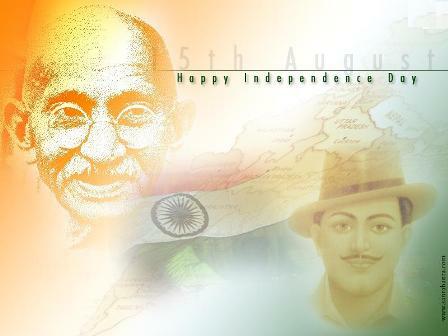 On August 15, 1947 – India kept her ‘tryst with destiny’. Midnight bore her the precious gift of freedom. Following an announcement on August 17, 1947 Pakistan became the other independent state. Gandhi, the father of the nation, did not join in the celebrations that followed. He was elsewhere working in riot torn areas, praying for peace. For him independence was tinged with sadness and disappointment. He was ready to withdraw from active politics. Accusations of siding with the Muslims and giving Pakistan away too easily, dogged Gandhi since the day the state of Pakistan was declared. On January 30, 1948, a Hindu fundamentalist called Nathu Ram Godse shot the Mahatma. India lost the man who, alongwith so many others, had taught it to dream of independence, and to throw a bridge between that dream and reality. and on August 15, 1947, Indians had walked across that bridge. 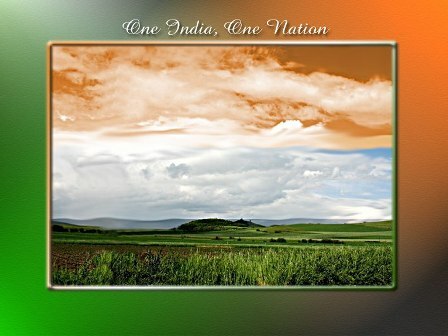 Download National Song of India (1.06 MB, 1:09 Sec.). 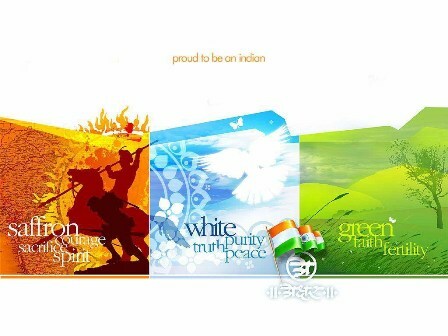 A very significant facet of the nationalism of India is the cornucopia of national symbols, which present a vivid canvas of the national elements of India. Know more about these national symbols. 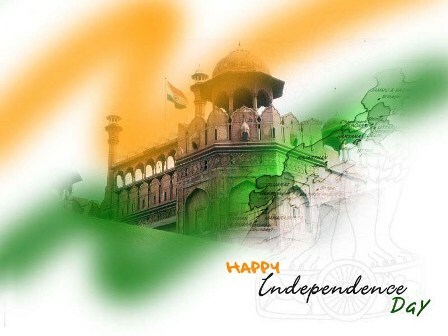 The Indian independence was certainly not attained on a silver platter by its people, but was a tale of a long and arduous struggle that bore the fruit of freedom for the Country. 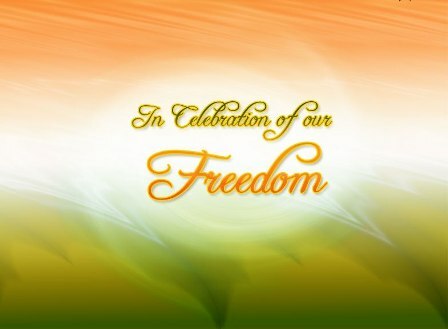 Historical background of the Indian freedom struggle. Culture & Heritage: The ancient land of India portrays a landscape of vibrant cultural heritage and spiritual mysticism, which speaks volumes for its vast display of colourful traditions and rich heritage. Know more about the culture & heritage of India. 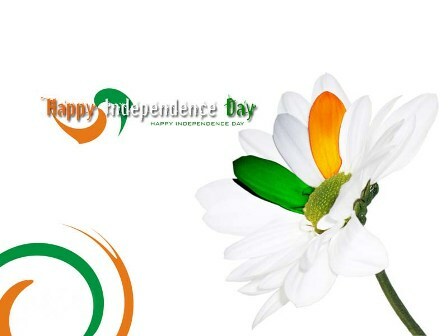 India’s Independence Day is celebrated on 15 August 1947, India attained freedom from the British Rule. 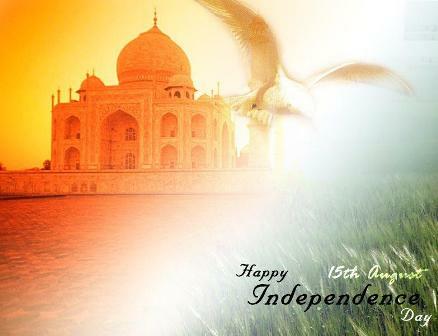 So every year, August 15 is celebrated as the Independence Day in India. 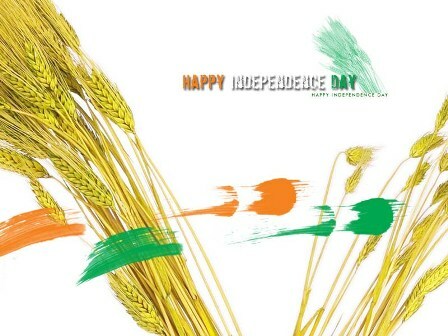 Independence Day is a celebration of our culmination of long struggle for freedom. 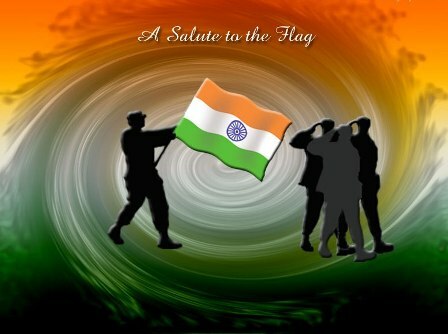 It is celebrated all over the country through flag-hoisting ceremony. The day is a national holiday in India. 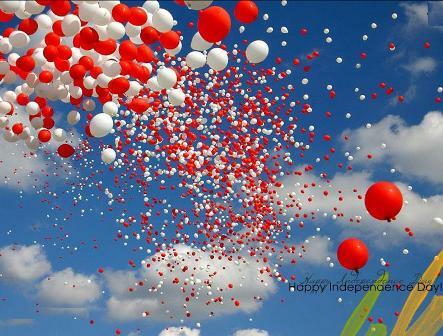 This national festival is celebrated with great enthusiasm all over the country. 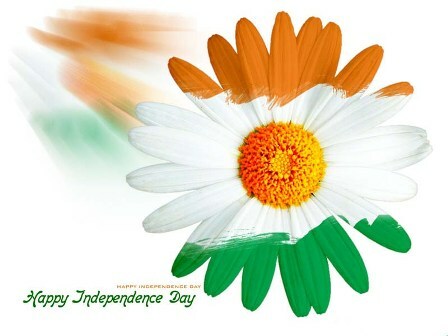 It was this day when India’s tricolor flag was unfolded by Pandit Nehru on the barricades of the Red Fort at Delhi. Each and every patriotic soul watched with excitement and paid tribute to thousands of martyrs who sacrificed their lives for India’s freedom.